Charlie is a 2004 graduate from the United States Military Academy. Commissioned in the Field Artillery, he served from Fire Support Officer to Company Commander with 3rd Brigade, 101st Airborne Division, including 26 months deployed to Bayji and Mahmudiya, Iraq. 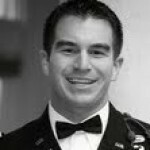 From 2012 to 2015, MAJ Lewis taught American Politics and Public Policy in the Department of Social Sciences at USMA, serving as Department Executive Officer his last year. In May 2015, he became a Cyber Operations Officer. His awards and decorations include the Bronze Star (1 OLC), Meritorious Service Medal (1 OLC), Ranger Tab and Combat Action, Airborne, Air Assault, Pathfinder, and Combat Diver badges. Charlie holds a Master in Public Policy from Harvard University. He is currently the Chief of the Cyber Leader College at Fort Gordon and is married to the former Marie Cicerelle, also a 2004 USMA graduate.